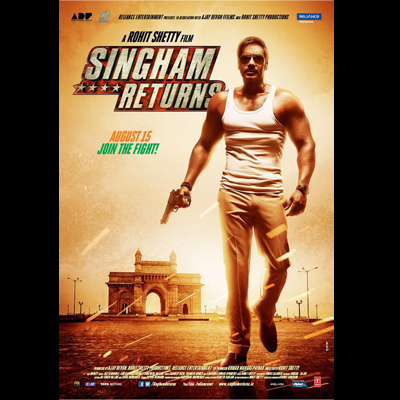 The sequel to the super successful Singham sees the return of Bajirao Singham (Ajay Devgn) as a cop in another city. The setting is Mumbai this time. But the action and drama is on a much larger scale. This time around, Singham fights with all that's wrong with our country. The story draws inspiration from real life, whether it is corrupt politicians, cons masquerading as Babas, the helplessness of the system or the people's party. The heroes of the film are the cops, not just a cop. The story begins when one of Bajirao's team members is found dead with an ambulance full of money. To protect the sanctity of the force, Bajirao decades to investigate the matter. Soon enough, he finds out the two men responsible for the act - an evil Godman (Amile Gupte) and his wily associate (Zakir Hussain). How Bajirao then uses the system to fight the bad guys is what the film is about. And Avni (Kareena Kapoor) plays his love interest. Rohit knows how to entertain and he does that in parts. The story is predictable no doubt but Rohit packs it up with an interesting screenplay. The film is over-the-top; it's even unreal at times. But Rohit gets the emotions right. If you understand the tone of the film and what it's meant to deliver, you'll enjoy it better. The idea is simple - Bajirao Singham is a people's hero so don't slow down on the awe-inspiring moments; the ceetees and taalis will come for sure. And that's where 'Singham Returns' delivers big time. Everytime the screenplay slows down the pace, Rohit adds yet another high-speed highlight sequence that grabs your attention. The film is full of such clap worthy moments. Ajay Devgan is good as usual and keeps his Bajirao act intact. Amole Gupte as the Godman succeeds in annoying, Dayanand Shetty repeats his Daya act from the popular serial CID and makes a good impact. His 'darwaza tod do Daya' moment is sure to bring the house down. Haven't we seen enough of corrupt politicians and babas in too many films before? The film could've also been twenty minutes shorter. The many scenes at the mosque may have had good intention but it does seem like they were aimed to woo a particular section of fans. The dialogue baazi in the action scenes just slow down the pace, when all you want to do is see the baddies' skulls being bashed. Kareena Kapoor bubbly act is a less appealing version of her character in 'Jab We Met'. As like all Singam series and Rohith Shetty movies, it also on the way to make a great business.